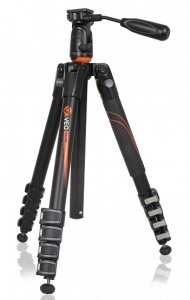 The Vanguard VEO 235AP tripod combines an innovative compact pan-head design with a lightweight and sturdy aluminum tripod. 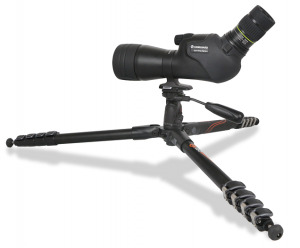 A full featured tripod kit, the Vanguard VEO 235AP is perfect for photographers and outdoor enthusiasts looking for a spotting scope support. Quickly swing the exclusive VEO column into place, connect your equipment and you’re ready at a moment’s notice. 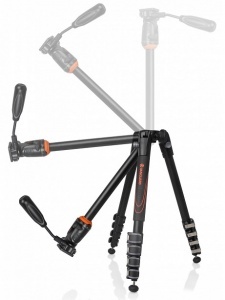 Stable 23mm legs combined with new leg lock design, which allows you to adjust tightness, supports spotting scopes and cameras up to a Pro DSLR with grip and long lens. 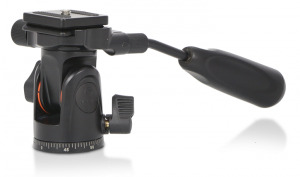 The VEO 235AP also works well for owners of standard DSLR cameras or Mirrorless 4/3 camera kits. The two way pan-head, with Arca Swiss compatible release plate, is designed with a quick-fold handle that minimizes the folded length of the tripod. With feet that can be converted from rubber to spikes, you'll be ready to shoot in urban or outdoor environments. Easily position legs to three angles with the simple push of a button. With the included adapter, adventurous photographers can capture low angle shots or shoot macro photography. A stylish design with soft rubber handle provides an unbeatable grip. Use the included carrying case when you are ready to take the Vanguard VEO on your next adventure. Dedicated to birders and photographers who love to travel, the Vanguard VEO 235AP tripod offers a new breed of super lightweight, compact usability.